In fact what *The Man of Action* does, is performing magic tricks in mime. The action of *The Man of Action* is much like a ritual: a narrative gesture without explicit narrative. By fusing two illusion based actions (magic and mime) the action becomes meaningless - thus reduced to mere action. The presented composition of magic and mime reduces the presentation into pure action, devoid of any meaning. Here film does not serve as a basic material or means of transportation of a history, but as a visual medium in its purest form. The reduction and disentanglement of an essential part of what we understand as „film", namely the sending of a message, is quoted by Dostoevsky's question: „ But why does he (mankind) love, up to passion, also the destruction and the chaos?" Because here, film without action turns into the very own form of chaos, the dissolving of any order. Gabriel Lester has performed this conceptual work of video art twice. First he performed it in Iceland in 1997 as *A Man of Action*, and again in 2007 as *A Man of Action Returns* in the Peruan Andes. 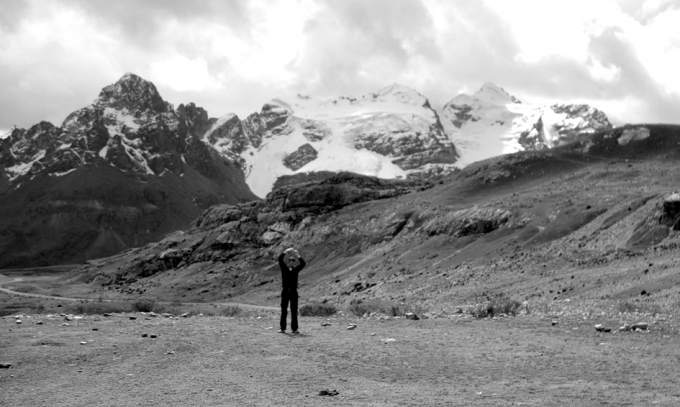 The idea of repetition was already there, before travelling to Peru and without this work being a rehearsed performance, Lester's unconsciously performed movements, in front of those spiritual landscapes, are very similar to each other in both films. Therefore *A Man of Action (Returns)"* can be understood as a gestured action that can be indefinitely re-executed and - in contrast to a repeated rehearsed performance - it is based on the subconscious choice of representation possibilities of the artist's magic. Lester presents this re-enactment that can also be understood as a mirror of time, as the magic performer and by this presents the artist as an artist in its original sense.